Does Miraclebody have a catalog? Miraclebody does not have a catalog at this time. Can you send special offers or coupons by regular postal mail? At this time, we only send special offers via e-mail. Please subscribe to our mailing list to receive the latest Miraclebody updates, offers, and more. Is Miraclebody the same as Miraclesuit? Miraclebody was created by the makers of Miraclesuit, the #1 brand of control swimwear. To learn more about Miraclebody, please visit the About Us page of our website. What holidays are Miraclebody closed? New Year's Eve, New Year's Day, Memorial Day, Independence Day - July 4th, Labor Day, Thanksgiving Day, Friday after Thanksgiving, Christmas Eve and Christmas Day. Please take this into consideration when ordering and note that we will not send any shipments after 2 p.m. E.T. on the day prior to a holiday, or on any holiday or weekend. Shipments will resume the first day back from a holiday or weekend. How do I know what style I've purchased in the past? 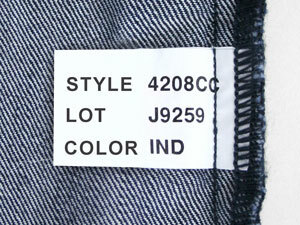 If you are looking to re-order and would like to know what style you need, every pair of Miraclebody pants have an ID tag stitched inside that shows its specific style number and color. To locate the tag, turn your pants inside out and look inside the right leg, inner seam, towards the bottom of the leg. What makes Miraclebody different than other brands? You can learn about the benefits of Miraclebody control fashion apparel by clicking here. We recommend using our size chart to find your fit. All of our apparel is machine washable. We recommend washing your Miraclebody jeans inside out on a gentle cycle and tumble dry on low heat. Are your jeans available in petite length? Yes, select styles are available in Petite length, a 29 1/2 inch inseam, in sizes 2P through 16P. Are your jeans available in tall/long length? Tall length jeans are offered in sizes 2 through 16 and have a 36" inseam. Our regular length jeans have an inseam of 32 inches. Do you offer plus sizes? Miraclebody offers sizes 18W through 24W in select styles. After submitting your order at Miraclebody.com, you should be directed to a Thank You page. Additionally, you should receive an order confirmation via e-mail. If you are experiencing ordering issues or believe your order was not received, please send an e-mail using our Contact form or call Customer Service at 1-877-836-4610. Please send an e-mail using our Contact form to inquire about the status of your order or you can call Customer Service at 1-877-836-4610. Please note that you will receive an e-mail notifying you when your order ships. This e-mail will include tracking information. If your order has not been shipped yet, you can cancel or make a change by sending us an e-mail using our Contact form or by calling Customer Service at 1-877-836-4610. I chose 2nd Day or Next Day shipping. Why hasn't my order arrived yet? Next Day and 2nd Day shipping refers to how quickly your order should arrive after it has been shipped, and does not include the time that it takes to process your order. Additionally, credit card authorizations pending approval and courier issues could delay your order. I bought my Miraclebody merchandise at a retail store or from a different website. Can I return it to you? We can only accept returns of merchandise purchased from miraclebody.com. Likewise, any merchandise purchased from miraclebody.com cannot be returned to a retail store. The merchandise I ordered arrived damaged. Do I have to pay additional shipping charges to exchange it? No. If your order arrives damaged, we will gladly replace it at no additional charge, including shipping and handling fees. Can I return or exchange an item after making alterations to it? Unfortunately, we cannot issue any type of reimbursement/store credit/refund for items that have been altered. Can I return merchandise using any shipping method? We highly recommend using UPS for your return and we enclose a UPS return shipping label with your order for your convenience. If you select a different carrier, you will be responsible for any associated shipping fees. Does Miraclebody ship to Canada? Yes. Shipping rates are listed on our Shipping Information page. What options do I have for delivery service and carrier? Miraclebody can only offer UPS standard ground shipping to Canadian customers at this time. What fees and charges will be applied to my order? Miraclebody does not charge sales tax, duties, or brokerage fees. You will be responsible for directly paying all applicable sales tax, including GST and PST, and duties to customs upon delivery of your order. Brokerage fees are paid for by Miraclebody as a courtesy to our Canadian customers. Please contact your Canadian customs office for a detailed explanation of how duties and taxes work when ordering online from the U.S. if you need further assistance. Can you tell me how a promotional code is applied to an order? When using a promotional code on Miraclebody.com, the applicable discount will appear as "Promotional Savings" and will be deducted from your Order Total in your shopping bag during the checkout process. For Miraclebody.com offers that do not require a code, the offer will state "no code required" and the discount will automatically be reflected as "Promotional Savings" in your shopping bag during the checkout process. How can I learn more about Miraclesuit?